City of Clarksville Mayor Kim McMillan and Montgomery County Mayor Carolyn Bowers were at the Company’s green ribbon cutting to recognize what the Company has done to make a difference. Mayor Bowers began the conversation by asking what the Company had done differently to earn certification. Bowers commented on how efforts like Budweiser’s help the community and asked about any changes they’ve made in energy reduction. Hand interjected that they have upgraded the lighting in all of their facilities except in Chicago, he joked, which they will begin working on next year. “We’re recycling a lot more paper and we have also reduced the amount of paper we’re using. Instead of printing out work orders, we now send them to employees through their smart phones,” said Batson. The Hand Family Companies, who own Budweiser of Clarksville in addition to six other facilities throughout Tennessee and Kentucky and with plans to enter business in Illinois, specialize in the sale of beverages, including a variety of beers, Monster Energy drinks, and numerous other non-alcoholic flavored beverages. 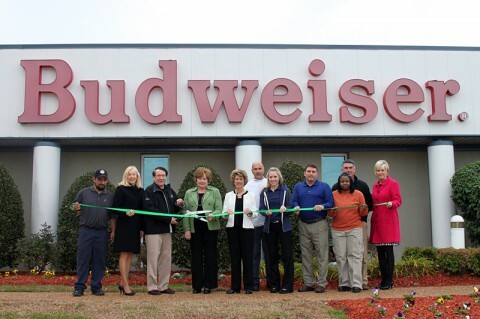 The Company began in Clarksville in 1949 when Raymond C. Hand opened a small distributorship in Clarksville which later became affiliated with Anheuser-Busch under the leadership of Raymond’s son, Charles Hand. The Company currently is led by Charles’ son, JR Hand, President and CEO. Charles serves as Chairman of the Board. Other Company principals are Charles’ daughters, Charlsie Hand Lankford of the property management division and Aim-ee Hand of the financial division. Visit www.mcgtn.org/green or contact Michelle Newell at or by calling 931.245.1867 for more information about the CMC Green Certification Program.